Ever since the LED light arbor project (linked here), I have been searching for a reliable way to support 5-6 foot boards for face planing on my 4 foot worktable. For thicker stock, the overhang didn’t really matter; the work was rigid enough to support itself. On thinner pieces (less than 6/4 or so), although edge planing was usually fine, flex at the ends while face planing caused me to unknowingly plane humps into the work, no matter how sound my technique. Just not enough tabletop real estate for face planing longer, thinner stock. After much debate (I even consulted Christopher Schwarz on the issue, whom I thank greatly for his quick response and prescient input and whose Lost Art Press I once again plug), I decided to laminate a planing slab (like a Japanese workbench). 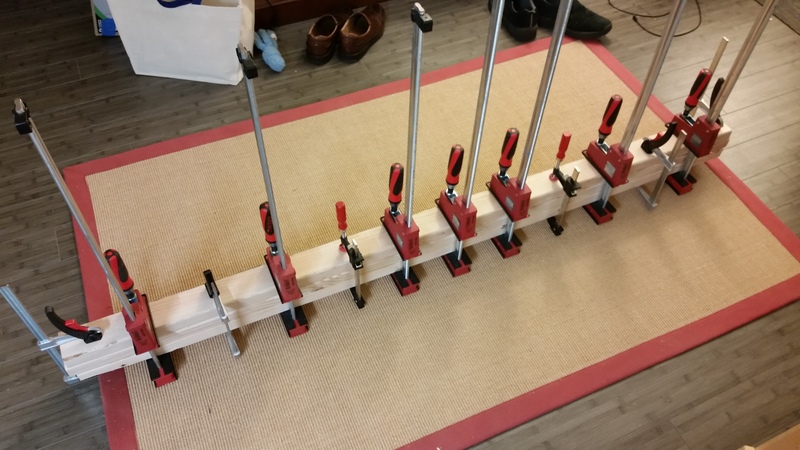 Made from inexpensive materials, the slab would be rigid and flat and could be clamped to my worktable with angle irons or leaned against the wall when not in use. It would also have a Veritas inset vise and dog holes for Veritas planing stops and holdfasts. Rough sketch in hand, I went to the home center on a lazy Sunday and dug through the 2x10s for an hour or so (the 2x12s were so saturated they were almost too heavy to move on my own) and found 36 feet of the driest, straightest, clearest Douglas Fir 2x10s available (all from the bottom of the pile, sadly). 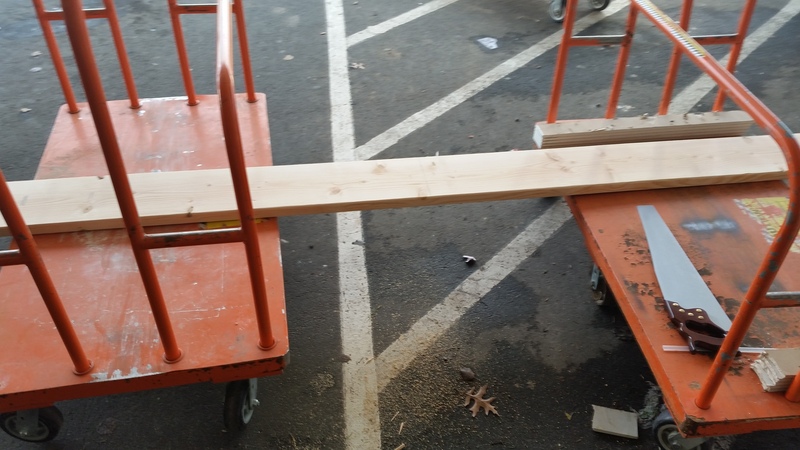 In the parking lot, I used two lumber carts as saw benches and piled the six 6 foot lengths in the car. Quite proud of myself for this one. Ever since, in my spare hours, I have been hand ripping 3 inch wide lengths, face planing the gluing surfaces and laminating the pieces, one at a time (Paul Sellers’ workbench playlist on YouTube is a great how-to for preparing dimensional softwoods for laminating into a bench top). The whole lamination should be approximately 18 inches wide (which equates to about thirteen boards) , 72 inches long and 2.75 inches thick when finished. I think, though, that when the slab gets to be about 10 inches wide (seven boards or so), I will flatten the bottom by hand and skip plane it with my thickness planer. That way, I can more easily finish up the second half of the lamination, using the first half as an (albeit smaller) planing slab. Only four more laminations to go and I’ll have half a planing slab! 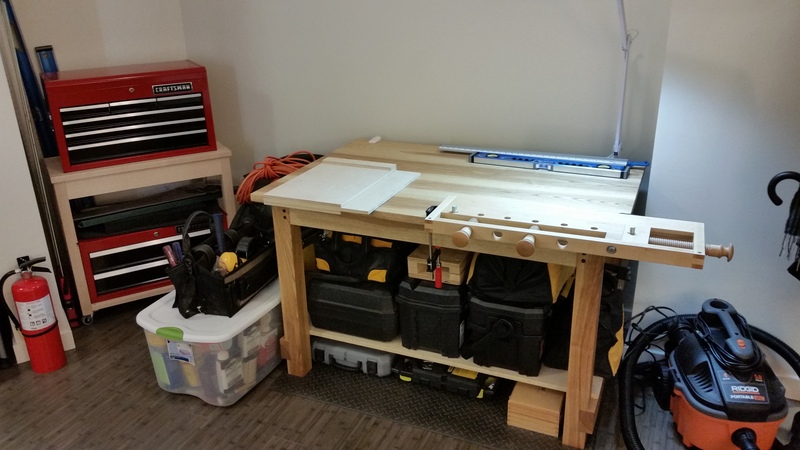 Once I have the space, I will probably re-purpose the planing slab as the bench top for a proper workbench for lighter work (and maybe add a face vise). Until then, though, I am looking forward to having a real planing surface, so I will keep laminating.